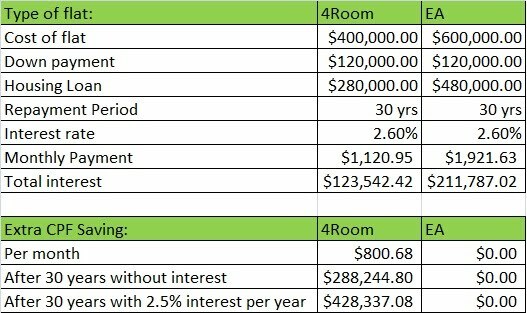 Lifelong Financial Freedom in Singapore: Is it worth to buy a big flat now and downgrade it when approaching retirement? Is it worth to buy a big flat now and downgrade it when approaching retirement? I happen to hear from people saying that they would be buying the biggest flat that they can afford and downgrade it when they are approaching retirement. The reason to downgrade is to take out some cash to support themselves during their retirement. But is it really worth to do that? Let us do some simple calculation to find out. 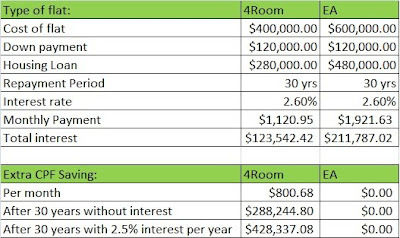 I am using example of a 4 room resale flat which costs $400,000 and an EA resale flat which costs $600,000. The payment for both the flat will be using CPF. So based on my calculation, buying a 4 room flat instead of EA flat will provide a saving of around $800 per month. The total saving without any interest after 30 years will be around $288,244. But assume that CPF is giving 2.5% interest per year for the next 30 years; the amount will compound to $428.337. So conclusion, if the difference between the selling price of EA flat and buying price of 4 rooms flat is more than $428.337, then it is worth it. If not, it is not a good idea to buy a big flat and downgrade it later. And also please note take I did not include the possible agent commission and renovation cost when doing the downgrading. Don't we feel sad to force downgrade ourselves to meet living expenses towards the last leg of our life journey. I think this is not a good investment idea. I agreed with you that it is not a good investment method.